Broughton Beach is the stretch of shoreline along the Columbia River, just north of the Portland airport. It has been a popular spot to access the river to scan for waterfowl in winter, and the shore attracts some neat birds, like Horned Larks, American Pipits, and the occasional Short-eared Owl. There used to be free parking there, but that was eliminated when the adjacent public boat launch was expanded to include a nice new car parking lot (with a fee station). There weren’t many birds on the water during my recent visit. 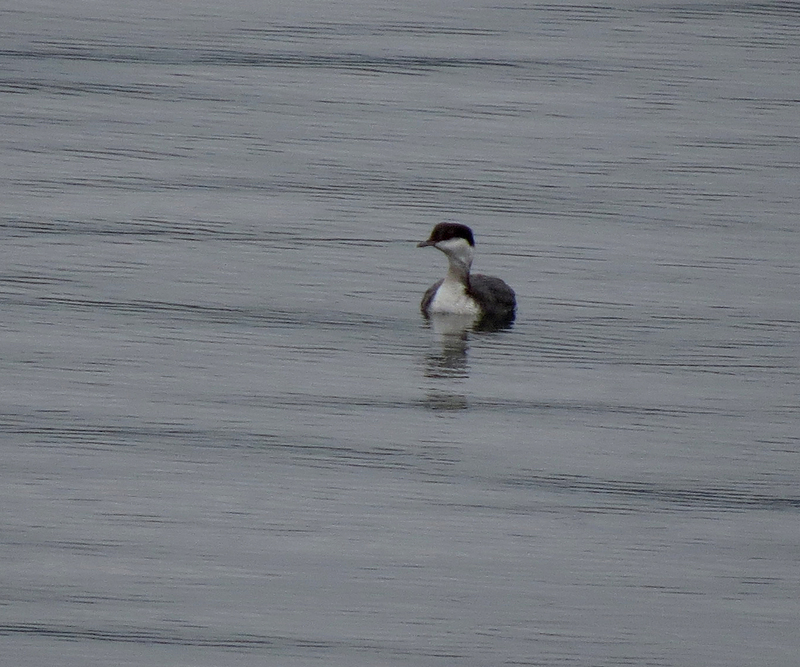 Here is a distant Horned Grebe. 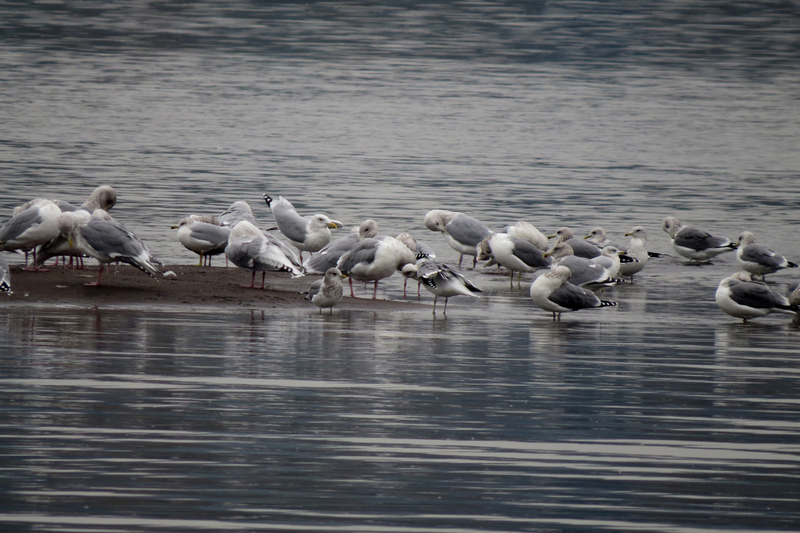 A mixed flock of gulls was loafing on a sand spit. There are at least four species in this photo, lots of California, a Mew, a Herring, and a few Ring-billed. The gull flock was resting after being harassed by this guy. This Peregrine Falcon spent several minutes flying through the flock, taking half-hearted swipes at various gulls. Perhaps he was testing for any individuals that were injured or particularly slow. This entry was posted in OR Birding Sites and tagged Broughton Beach, California Gull, Herring Gull, Horned Grebe, Mew Gull, Peregrine Falcon, Ring-billed Gull. Bookmark the permalink. Wow, I’ve never seen a falcon there before! Pretty cool, nice shot of him too! 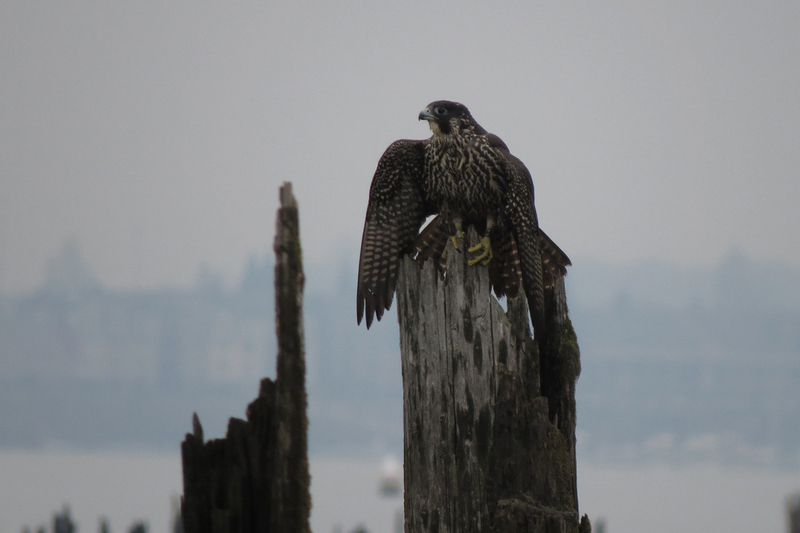 And when I said falcon, I meant Peregrine. Kestrels up the wazoo there!